The Naked Boat and the Boatist: RM sailboat called "Horatio"
Recently it was brought to my attention that somebody named their brand new RM 1060 sailboat after me. That's right, me HORATIO. Either the new boat owner has been reading my blog or he has a dog named Horatio. Take your pick. 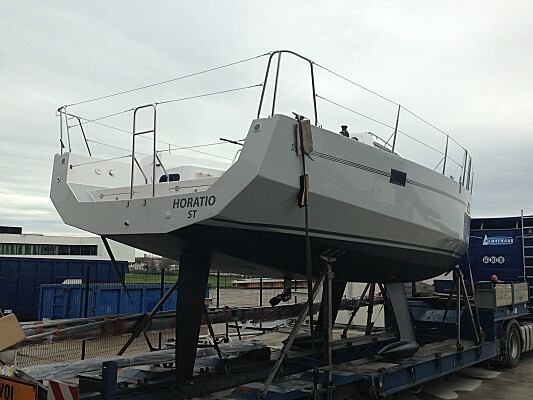 You can find the "Horatio RM" boat at the RM Yachts website in their blog section. While you're at it, also check out their main site. RM sailboats come in various sizes, feature really amazing panoramic pilothouses and have attracted a cult following. Did I tell you they're made of plywood? We're talking about an epoxy plywood shell reinforced by a galvanized steel structure. Unfortunately they also cost a small fortune. I thought plywood was cheap. But what I really like about them is that they have twin keels and a very long rudder, enabling them to stand up like a three-legged dog at low tide. That's really useful for scraping the hull, changing a zinc or having a picnic in the shade under the boat. The new RM 1060 called Horatio fresh out of the factory. May you live up to your (my) name!!! Here's another crappy film shot sailing to Nazare on my Corbin 39, a more traditional boat. I seriously need to take film lessons. Lastly, and sadly, I ran into a problem replacing my gearbox. To remove it, first I need to pull the prop shaft back. To pull the shaft back, I need to loosen some screws on the Duramax stuffing box. A piece of cake right? Wrong, two of these screws have stripped heads. So I spent a couple of hours watching Youtube films teaching me the fine art of removing screws with stripped heads. Problem solved, right? Wrong. Where am I going to get new screws of the exact same size. I think I'm screwed and it's no laughing matter. I emailed Duramax today urgently asking/begging for new screws. The problem is that they also manufacture stuffing boxes and many other parts for large ships, so I'm not too optimistic they'll pay much attention to my tiny screw predicament. Time to think like a Cuban in need of unavailable car parts. On some occasions being a boat slave is a bit of a hassle and an impediment to a carefree life. Ah yes, screwed screws. It gets real fum when they are imperial opposed to metric or both (tools?). But in your case, take a good one to a screw shop (?... sounds odd) and get some new ones. Or is that just some carefree proposition? Good luck all the same. Hmmm, the "screw shop" (the hardware type) sounds like a good idea. A 2-week haulout...I could do it in 4 days if it weren't for the gearbox: 2 coats of antifouling, anode change, scrub the topsides and presto, back in the puddle. But you're right, for some reason or another it always takes 2 to 3 weeks. Boat slave laws of physics!